Humankind benefits in a multitude of ways from ecosystems. Collectively, these benefits are becoming known as ecosystem services. 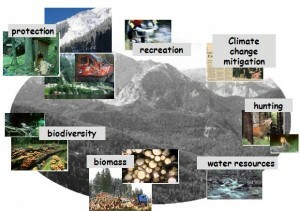 While ecosystem services are very diverse, they can – according to the Millenium Ecosystem Assesment – be grouped into four broad categories: provisioning, such as the production of food and water; regulating, such as the control of climate and disease; supporting, such as nutrient cycle and crop polination; and cultural, such as recreational benefits. Twenty-nine percent of the EU27 land surface is covered by mountains, and forests cover 41% of the European mountain area providing a disproportionately large number of ecosystem services. Often, the demand for ecosystem services from a single parcel of mountain forest is manifold, including protection from natural hazards such as rockfall and avalanches, timber prdouction, and landscape aesthetics (regarding tourism and recreation). Nature conservation values and biodiversity aspects are often involved as well. Ecosystem services delivered by mountain forests.